Killer Frost Almost Murders Barry to Escape "Gorilla City"
The Flash begins Part One of its “Gorilla City” event with a sweeping airborne shot of Grodd’s new home. The super intelligent creatures live in a monstrous stone city marked with giant gorilla statues, and at the center of the marketplace stands a colosseum. It’s an ambitious set piece for The CW’s second most fantastical superhero show — though Legends of Tomorrow is more outlandish, somehow the stakes on The Flash always feel higher. After trapping Flash and his buddies in prison and dampening their powers, Grodd tells the team they must kill the leader of Gorilla City, Solovar, before Solovar leads the gorillas into Earth-1 in an attack on humanity. Grodd knows Flash has to protect his Earth, and he also knows killing Solovar means he’ll take the Gorilla City throne. If Flash kills Solovar, Grodd considers that a win-win situation. After getting slow-motion pummeled for a few minutes, Barry uses the “Reverse-Flash” move that killed both his parents to reach inside Solovar and screw him up internally. When Grodd says the brutal victory isn’t good enough, the team convinces Caitlin to freeze Barry just enough to make him look and feel dead. 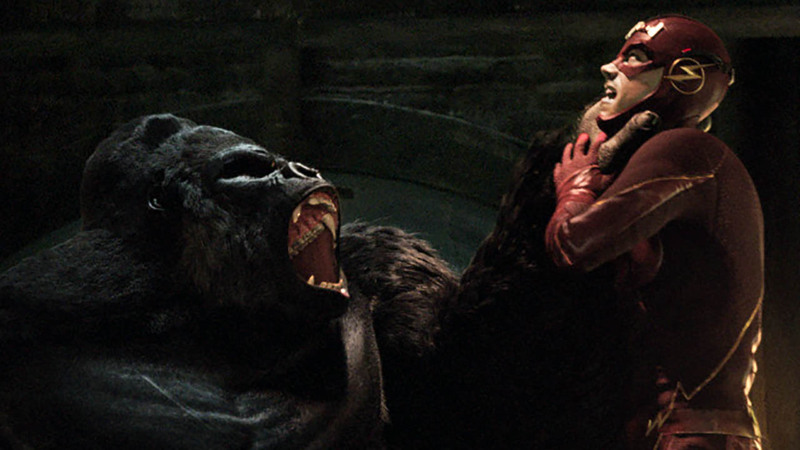 Grodd checks his pulse, says “cold,” and dumps Barry’s body outside the cages. Barry vibrates himself back to health, breaks his buddies out of gorilla jail, and the entire “gorilla city” ordeal ends pretty anticlimactically. An armored Gorilla Grodd as he appears in DC Comics. When the group gets back, Wally asks, “What happened, did you fight some super smart apes?” Julian says, “Yep, we did.” There’s not much else to add. Although the team’s gorilla problem gets wrapped up quickly, it seems Grodd and the rest of his super-sentient friends will make trouble for Team Flash on Earth-1 in Part Two of “Gorilla City.” At the end of Part 1, Wally and Jessie kiss, Caitlin and Julian go on a date, and Barry asks Iris to keep him awake past bedtime with some sweet lovin’. Only Cisco’s alone, and in the final shot, we see his crush Gypsy standing at the foot of Gorilla Grodd’s throne. There’s trouble ahead. The Flash airs Tuesday nights on The CW at 8 p.m. EST.